Owaisi took to Twitter to criticise the Army General after he spoke about the rise of political matter, and reminded him that the Army will always work under an elected civilian leadership in India, and said that the democracy and the constitution has allowed the functioning of any political party. 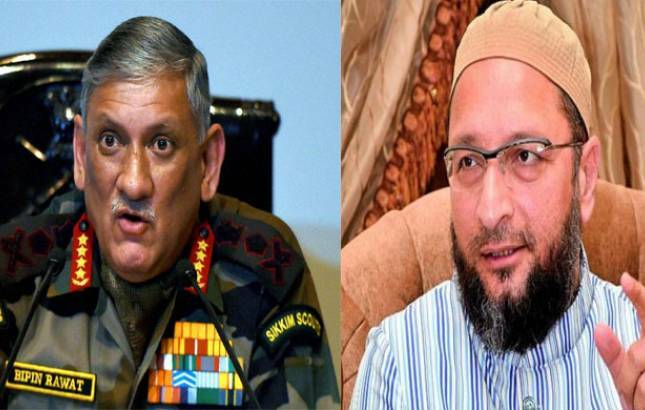 Asaduddin Owaisi, the chief of the All India Majlis-e-Ittehad-ul Muslimeen (AIMIM), and Maulana Badruddin Ajmal, President of All India United Democratic Front (AIUDF), on Thursday, criticised General Bipin Rawat for talking about the rise of the AIUDF in Assam. Owaisi said that the Army Chief should not interfere in political matters as it is not his work to comment on the rise of any political party or any political issue. On Wednesday, Rawat referred to the ‘faster pace’ of growth of the AIUDF in Assam, underlining the ‘population dynamics’ of the North-East region in particular and claiming that it can no longer change. General Rawat was speaking at a seminar on ‘North-East Region of India- Bridging Gaps and Securing Borders’ which was organised by the Centre for Joint Warfare Studies and Headquarters Integrated Defence Staff of the Ministry of Defence. Maulana Badruddin Ajmal, the President of the AIUDF, on Twitter asked why was it the Army Chief’s concern that a political party is rising faster than the BJP, and blamed that the growth of smaller alternative parties like the AIUDF and AAP are because of the misgovernance of the big political parties. The Indian Army, in a clarification over the matter, gave a statement that nothing political or religious was mentioned in the talk by General Bipin Rawat. The Army Chief just mentioned amalgamation and development in the seminar on the North-East organised at the DRDO Bhawan on Wednesday. To this remark of the Army, Maulana Ajmal questioned if nothing was wrong, then why was the Army Chief dragging the political party in his speech, whose representatives were democratically elected by the Indian citizens. The AIUDF was formed in 2005 with an aim to raise the cause of the Muslim community, and currently the party has three Parliamentarians in Lok Sabha and 13 legislators in the state assembly.